This card cannot be Normal Summoned or Set. This card cannot be Special Summoned except by removing from play 2 face-up monsters you control (1 "Blackwing" Tuner and 1 non-Tuner). 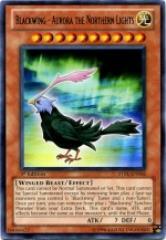 Once per turn, you can remove from play 1 "Blackwing" Synchro Monster from your Extra Deck. This card's name, ATK, and effects become the same as that monster's, until the End Phase.